Hey guys I have a few mkv files I want to convert to play on the ps4 via a media server. I been trying to find mkv2vob on Mac but can't find anything? Anyone has the Mac version? I have been using mkv2vob to convert MKV files and to split them into 4 gb parts which I then copy onto my PS3. Today I converted a movie but it wouldn't play on my PS3. The only thing that has changed since I last used it is that I installed Mavericks, and I thought perhaps it has issues with Maverick? I was wondering if anyone could suggest an alternative application that would allow me to convert MKV files into either AVI or MPG so that I can then add these to my Playstation 3. MKV2VOB is an open-source program with a self-explanatory interface that allows for an easy and quick remux of a .mkv file into a VOB file for playback on Sony PlayStation 4/3 without transcoding or recompression. But problem is this awesome niche app is only available for Windows platforms. For Mac users in need of MKV to VOB conversion, they will have to make a switch to a mkv2vob for Mac alternative, like MacX Video Converter Pro. Ultimate Mac alternative to MKV2VOB to convert videos to MP4, MOV, M4V, MP3, etc for playback on iPhone iPad Android 83X faster speed & no quality loss. Download videos from 300+ video sites like YouTube, FB, Vimeo, etc. Compared with mkv2vob, this alternative to Mac MKV to VOB converter supports 320 more video formats than MKV with H264 H265 video and AC3 audio, ranging from AVCHD, TS, M2TS, MTS, MKV to MP4, MOV, FLV, AVI, WMV, WebM, etc. In addition, the already preset profiles for PS4, Apple, Android, and more in the alternative to mkv2vob for Mac make video conversion as easy as A-B-C, thus you can effortlessly convert MKV to PS4 or other mobile devices within minutes. High marks are also rewarded to the video converter as it boasts hardware acceleration, hyper-threading technology, multi-core CPU utility, and improved kernel module, greatly enhancing video converting performance, up to 83X faster converting speed than the similar tools. Step 1: Free download the video converter on Mac and run it. Click "Add File" button to add MKV files for conversion. A faster way to load MKV file is to directly drag it to this program. Batch conversion is also supported, you can load several MKV clips at one time. Step 2: This equivalent supports converting MKV to both VOB and PS4 from its output format list. 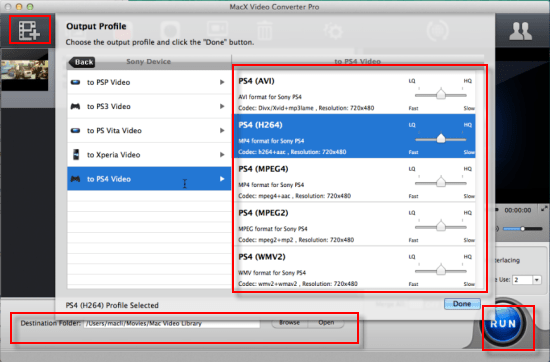 Here, you're advised to directly choose PS4 as the output format if you want to play MKV video on PS4. Tips: before you convert MKV to PS4 on Mac OS, you can at your disposal to edit your file like trimming, cropping, watermarking, merging, adding subtitle, etc. Step 4: Click on the "RUN" button on the bottom-right corner of this program's main interface to start video conversion. At last, transfer the output files to your PS4 for enjoyment. Note: MacX Video Converter Pro constantly upgrades to support the newest tech change. You can both convert video on El Capitan, Yosemite, Mavericks, Mountain Lion, etc and transfer MKV to iPhone 6/6 Plus/5S/5C, iPad Air 2, iPad Mini 3 with Retina, HTC One M9, PS4, Xbox One, etc with the help of mkv2vob for Mac alternative. If you are in a hurry to convert MKV files to AVI on Mac, MacX Free MKV Video Converter provides you best solution to free convert MKV to AVI for playback on PS3, Xbox One, and other devices.